The alpine village of Saint-Martin de Belleville resembles a sentimental Christmas card. A small area surrounded by alpine chalets made of wood and stone, and an old church illuminated at night - all this gives the resort the lovely charm of the Savoy province. Once upon a time in the French Alps appeared this small village, which it still remains: Saint Martin de Belleville in the Belleville Valley of the same name. Like no other Savoyard winter resort, St. Martin with the surrounding villages preserved its original colour. Thanks to a direct cable car, skiers from Saint Martin will within minutes reach the heart of the Three Valleys, where they will have to make a difficult choice from almost 350 ski slopes. Saint Martin de Belleville is one of the eight resort towns that make up the world-famous ski area «Les Three Valleys». The resort is located at an altitude of 1400m, by 8 km lower than the neighbouring Les Menuires, and connected with it by bus route. The village is located in a quiet place, with magnificent atmosphere and a good variety of bars and restaurants away from big crowds of tourists. Spending holiday here will leave best impressions and will not burden your pocket because prices for accommodation and services in Saint Martin de Belleville are lower than in the main ski area. Alps2Alps is a team of professionals specialized in premium quality transfer services to the Alpine resorts. At the service of our customers are always the most comfortable and reliable transfers at the most attractive prices. In Alps2Alps we know what exactly ski travellers are waiting for the transfer company. Arrive on time, in safety and with family-friendly service, right? Even if you are going to travel at the peak of the season, we still guarantee the lowest prices on all our services. The base price of the ski transfer will be the most profitable for you. We never overstate prices for our customers. In order to save money, we recommend you to book a transfer for the middle of the week, or after the high season. On weekdays Alps2Alps usually offer discounts up to 60% on all our services. The final cost of your transfer will be dependant on some following factors: availability and utilization of the vehicle, transfer schedule, toll roads and parking charges in the airport. If you have any additional requirements, don’t doubt to contact our customer service team to discuss your requests. 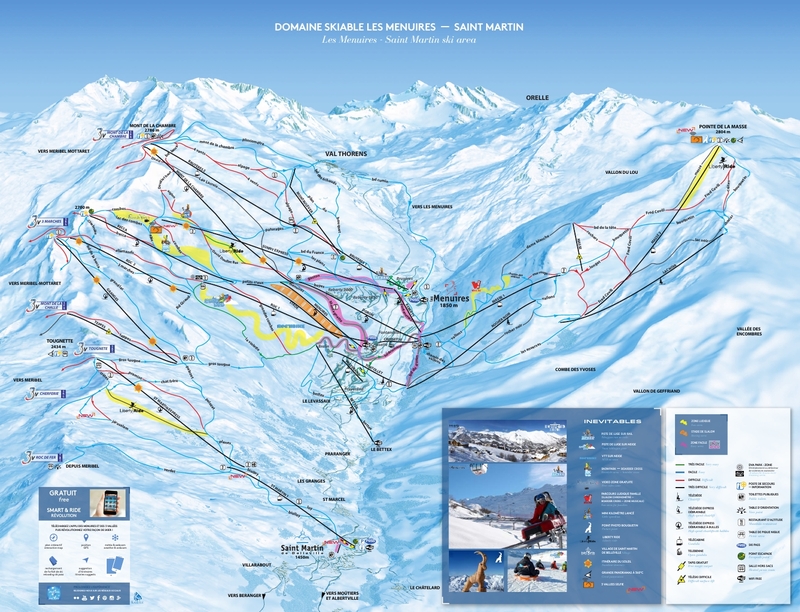 It is important to know that choosing the resort Saint-Martin de Belleville, you get to the world's largest ski area. Three Valleys covers 600 km of trails of various levels. Here you can ride from morning till night every day in new places. St. Martin is the ideal place for a peaceful family ski holiday in a relaxed atmosphere and close proximity to the countless ski slopes of the largest ski region in the world. In the surrounds of Saint-Martin beginners of alpine skiing will first of all find excellent training routes. Despite its visible and quite small size and its rustic flavour, Saint Martin offers its guests a lot of entertainment options and a rich après-ski program. In the 18 shops located here you can buy souvenirs for every taste, in local sports shops skiers can buy or rent all the necessary equipment, and for the smallest winter fans from 3 months to 5 years old is waiting the Piou-Piou mini club, located at the foot of the ski station in the center of Saint Martin. On the territory of the resort, there is also a kindergarten that accepts children from 2.5 to 5 years old, where caring educators organize interesting walks and games with snow. For "big" guests from 5 years in Saint-Martin there are 20 ski coaches working permanently, offering also snowboard, off-piste or freestyle courses. Customer service staff – 24/7 at your service! We always recommend you to book your shuttle to the chosen ski resort in advance in order to get the best value. Just give a call to our customer care team.